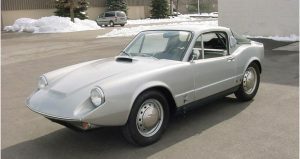 In the 1960s, Björn Karlström suggested that Saab should develop a new two seater sports car with a two stroke engine, but this time it would be a coupe and not a convertible. Two prototypes were developed, the Saab MFI13 by Malmö Flygindustri and the Saab Catherina by Sixten Sason. The MFI13 was the one selected for production. In 1966 the MFI13 was, after some modifications, put into production at ASJ in Arlöv as the “Saab 97″- that year only 28 units were produced, and a further 230 in 1967. The engine was a three-cylinder, two-stroke engine developing 60 hp. The Sonett II could do 0 to 60 in 12.5 seconds and had a top speed of 150 km/h. The vehicle in the Heritage Collection is an original 3 cylinder version. In 1966 only 28 and in 1967 only 230 vehicles of this type were produced. With the advent of emissions controls in the U.S., the 2 cycle automobile engine simply could not stand the test. Therefore, in late 1967, Saab started using the Ford Taunus V4 engine in their other models, they also wanted to use it in the Sonett II. The car was redesigned and renamed the Sonett II V4, with the 1500 cc Ford V4. A new hood was designed by Gunnar A. Sjögren, with a ‘bulge’, necessary to fit the higher engine. The bulge is slightly to the right so it would not obstruct the view of the driver. The engine produced 65 hp (48 kW) and the Sonett II V4 made 0 to 60 in 12.5s and had a top speed of 160 km/h. In total, only 1868 Sonett IIs were produced.